July 29, 2018: Monsters! Monsters! In the wonderful desert city of Phoenix, where Tunnels and Trolls first made its appearance as the poor man's alternative to Dungeons and Dragons, an interesting phenomenon soon appeared. After a few promising characters had gone down to defeat beneath the bludgeon blows of giants, trolls, ogres, orcs, and malignant stone statues – after dragons, Balrogs, and salamanders had incinerated a few rash adventurers – after that green puddle on the floor turned out to be a highly corrosive slime amoeba – it reached the point where, at the least sign of trouble, people would bolt for the exits shrieking Monsters! Monsters! 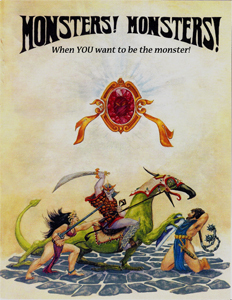 Not long after that, the same catchy battle-cry of Monsters! Monsters! began to be heard at any undesirable situation (such as my arrival at a science-fiction club meeting, or upon entering the kitchen and encountering the last fortnight's dirty dishes). So it was only natural that eventually the monsters should come out of their tunnels and dungeons to strike back at the smug world of the Men, Elves, Dwarves, Hobbits, etc., who had been so greedily despoiling their homes and treasures. This turning of the tables, to play monsters as protagonists, has proven to be even more hilarious than the original games. A monster lives by a completely different code of ethics, affording a splendid opportunity to get rid of the impure and perverted impulses which affect most of us – impulses it's hard to express while playing a hero. Monsters get experience points for wanton cruelty and destruction above and beyond the call of duty. Monsters! Monsters! is a variant of Tunnels & Trolls in which the PCs are, not heroes, but monsters. They come up out of the ground, head for the city, and wreak revenge for all the goody-goody "adventurers" who have been raiding their homes. This is the game where the monsters get even. It was also my first professional job. When I started with Metagaming, I was handed this manuscript and told to edit it, develop it, type it up (yes, TYPE! ), and paste it up for production. And I did. Had a great time with it, too. It was my first time working with Liz Danforth, who drew the monsters, wittily and wickedly. And it was my chance to meet Ken St. Andre, one of the wickedest GMs ever. Does it sound like fun? It is. And we're now selling the PDF on Warehouse 23. Cheap, fun, and very, very evil. Check it out and see (early influences, anyone?) how I got my start with RPG creation.